Beyond anything you have experienced in Alaska! If you are planning to travel all the way to Alaska, why not go just a little further and get away from the crowd? In today’s world, you must seek true wilderness and you will not find it just out of the city, or over the next hill. 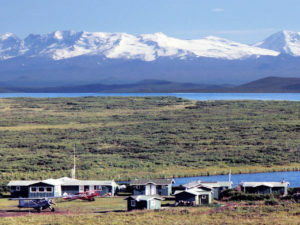 This is your chance to visit Alaska as it was when our parents and grandparents first came to the Territory of Alaska. Visit Wildman Wilderness Lodge, where Alaska is STILL a wilderness experience! Wildman Wilderness Lodge is a remote wilderness Alaska lodge providing guided Wildlife photo safaris and fishing trips on the pristine Alaska Peninsula for Salmon, Trout and Arctic Char. Wildman Wilderness Lodge is Alaska’s premiere wildlife viewing lodge. Before choosing an Alaska lodge, SIMPLY ASK: “How close is your nearest neighbor?” That tells the story, Wilderness or NOT! We are not located in a village or on a river with ANY other lodges. Wildman Lodge is truly a remote wilderness lodge. In Fact, we doubt you will see anyone all week, that you didn’t see at the breakfast table. Your hosts and life-time Alaskans, Butch & Kathy King, provide top-notch accommodations and outstanding meals in one of the most remote locations for world-class stream fishing in all of Alaska, perhaps in the world. Butch is an experienced Alaskan Bush Pilot and Alaska Master Guide with 46 years experience flying and guiding sportsmen right here on the remote Alaska Peninsula. For them, Wildman Lodge is home. “We enjoy showing our guests this very special part of Alaska that remains untouched wilderness. The fish & wildlife are as prolific as they were when our family first came to this frontier in the 1940’s. Alaska Brown Bear, moose, caribou and wolves are our closest neighbors. Even more unique creatures enhabit to beaches, tundra and alpine areas in our region. One day, you are accompanied by experienced pilots and guides Walrus Viewing as they haul out of the frigid Bering Sea to rest and digest on the black volcanic sand beach. The next day is an exciting jet boat excursion on Ocean River and its tributaries enjoying photo opportunities for magnificent Alaska Brown Bear fishing for salmon as well as numerous wild birds and other critters, small and large, that make this clear-water artesian river their summer home. We time our wildlife tours to coniside with the peak of the annual Sockeye salmon spawning season, when tens of thousands of spawning salmon attract scores of hungry brown bear that come to our river to enjoy the bounty that nature provides. These are truely wild, unhinituated bears, unlike those you encounter in the National Park. Nestled below the glacier shrouded, Mt. Veniaminof on the remote Alaska Peninsula, our comfortable facility is designed to accommodate just 16 guest, yet we host just 12 Wildlife tour guests each session and further reduce those folks to groups of 6 guests. Adventuring friends, couples, families and corporate groups are all welcome at Wildman Lake Lodge. All buildings have 24 hour electricity and safe hot water heat. Our remote location is way out of cell phone range, which most guests greatly appreciate. But, you can now check your email on the Wildman Lodge Wi-Fi computer, located in our Internet Corner Café. If you need to connect to the internet with your own device, you may request Satellite Access or make Satellite phone calls in necessary. Our valued guests are accommodated in duplex style guest cabins, each with its own bathroom and piping hot shower. Guests may choose from family cabins, twin guest rooms or king bedrooms with private bath for couples. You will find every rooms very clean and comfortable with attention to detail, each decorated in a different Alaskan decor. The Trapper’s Den, our comfortable living room overlooks Ocean River, where you can enjoy watching the trout rise, the salmon wake and majestic bald eagles making low passes over the rafts of unique Alaska waterfowl. Brown Bears are often spotted from the Trapper’s Den as they slink by at the edge of the brush line across the river. By the light of the Midnight Sun, you can watch fishermen, both two and four legged, as they work the clear artesian waters for salmon, trout and char. The Trapper’s Den is a great place to relax and tell your tales of andventure and share photos and videos the end each fun filled day. Our spacious dining room seats up to sixteen guests and our guide staff at meal time. The hand crafted Sitka Spruce dining room tables are set with elegant Bavarian china, personally designed for Wildman Lake Lodge by Christian Seltmann, from Seltmann-Weiden of Bavaria, Europe’s leading fine porcelain manufacture. We are proud to include your round trip flight from Anchorage in our all inclusive sport fishing packages. 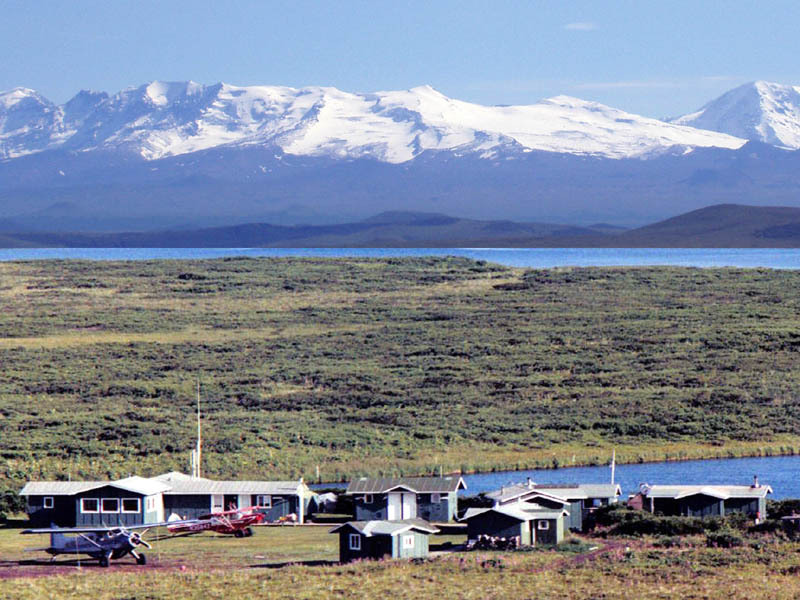 This scenic flight departs Anchorage’s Merrill Field, taking you through Lake Clark and Katmai National Parks, along the Bering Sea Coast and the Alaska Peninsula Wildlife Refuge, landing at Wildman Lake Lodge. Imagine, 500 miles, with out crossing a fence, powerline or road. Just mountains, glaciers wilderness and wildlife all the way. This flight alone is worth the price of admission!